Wivey Action held an Earth Hour Supper in partnership with St Andrew’s Church on Saturday, 30 March 2019. This was a family-friendly event with activities for children and attended by about 50 people. Earth Hour is a point in the year, close to the spring solstice and the time when things are beginning to grow, when people across the world switch off their lights for an hour in a show of solidarity and concern for this planet which is our home. There was a bring and share supper with vegetarian and vegan food, as we are encouraged to eat a little less meat for the sake of the planet, and for that meat to be of high quality, such as is raised by our own local farmers. The church was a wonderful venue, transformed with only candle-light for the supper. Our fifth Give or Take for Free was held on 15th September 2018, allowing unwanted household goods to be given away for others to take and put to good use. Another good Give or Take for Free on 21st April, with about 45 people attending. This time, small electrical appliances were accepted too, with PAT testing to check their safety. Four Give or Take events have been held since 2016 and proved very successful. Unwanted household goods, including kitchen ware, ornaments, toys, tools and more, can be given away for others to take for free and put to good use. Items are displayed from car boots or on the ground and what is not given away is taken back home. All are welcome to take part, but it is not for traders. No money changes hands and items are given free for personal use only. The next Give or Take will be in the autumn. For items needing repair, there is a new Wivey Repair Cafe, with the next session 10am – midday on Saturday, 28th April in the upstairs room at the Community Centre. On 24th March 2018, we had a great day planting trees with pupils and parents at Wiveliscombe Primary School. Weed roots were cleared in the morning, followed by planting of silver birch, rowan and wild cherry saplings in the afternoon. Click on following photos to view as a slide show. A couple of weeks earlier, on 10th March, we had a good day preparing the ground. An area covered in brambles and nettles was cleared in conditions that ranged from wet and drizzly in the morning to sunny in the afternoon. Well done to Barbara, Brian, Dave, Jon, Nick, Oscar, Patricia, Sara, Steve, Sue G, Sue H and Tim for all the hard work. Over the summer, Sara and Sue have done further great work to clear back the brambles. Most of the saplings are doing very well. Our second Give or Take for Free event on 22 April, 2017 at Kingsmead School car park was another success with plenty of givers and takers. Unwanted household goods were cleared out and given a further recycled life by others. Items passed on included books, toys, DVDs, suitcases, tools, kitchen ware, small items of furniture, envelopes, pictures, pea sticks, games, paving stones and much else besides. It was another lovely morning with plenty of pleasant chat. Don’t miss the next one! 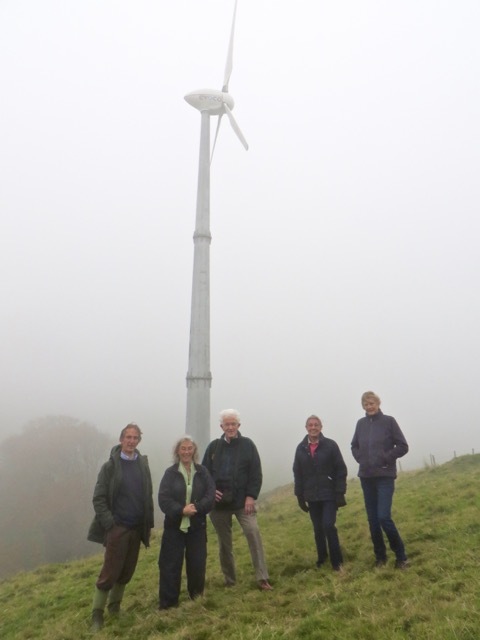 Wivey Action on Climate members visited a local wind turbine near Clatworthy on a misty morning on 30th October 2016. The turbine was installed five years ago, but has had some operating and maintenance problems relating to wind flow from the steep valley below. It was generating during our visit and it was good to see the blades turning. Most wind power comes from much larger turbines, but small installations, like roof-top solar, can still make a good contribution to local energy use. In 2015, official statistics show renewable energy contributed 22-26% of the UK’s electricity (depending on calculation method) with onshore wind being the biggest contributor, followed by biomass (plant energy crops) and then offshore wind and solar. In the Wiveliscombe area, there are at least four small wind turbines, but many siting constraints due to the landscape, grid capacity and potential interference with regional radar, including at Cobbacombe and Yeovilton. Our first give or take for free event at Kingsmead School car park on 10th September 2016 went very well. Some had a clear out to pass things on and others picked them up to keep them in use. All helped avoid waste, promoted reuse and had a good time too.